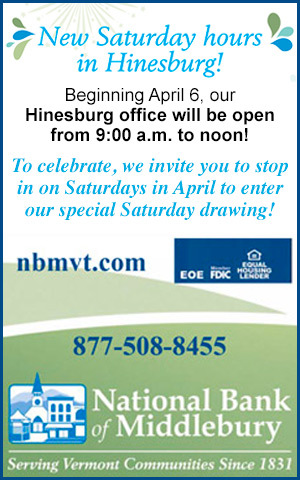 This page is sponsored by National Bank of Middlebury. At right is our most recent issue (May) as printed. Please note that, due to a broken press part, the printed May issue will not be circulated until Tuesday, April 30. Our apologies. We have some exciting news for you all. Red Wagon Plant’s Greenhouse #3 is now home to a weekend coffee shop. 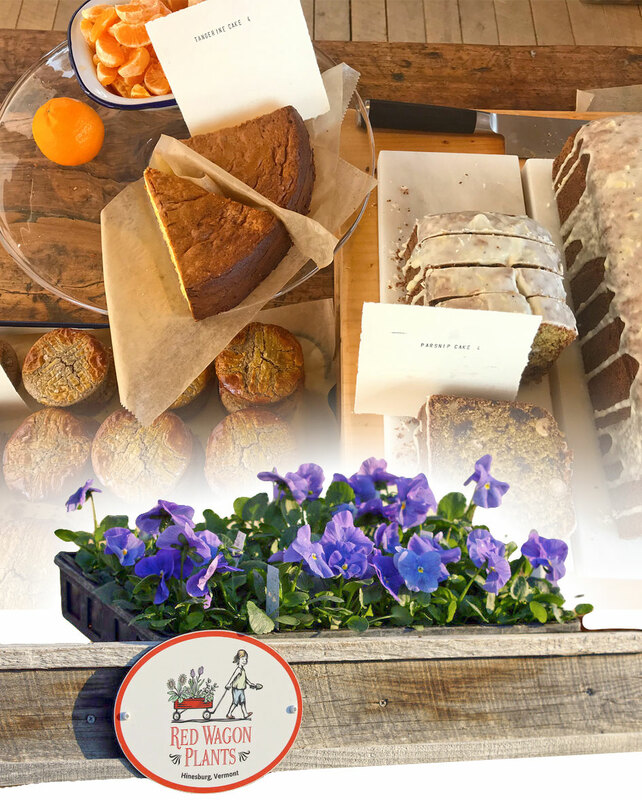 Our friends Julianne and Didier Murat from Vadeboncouer are showing up on Saturdays and Sundays with pastries, and making coffee (from Tandem Coffee Roasters) and fresh juice for you to enjoy while you soak in the sun and the plants. There is now a weekend coffee shop at Red Wagon Plants. Photo by Julianne Murat. We are so excited; after years of dreaming of this, it is finally happening. The inspiration comes from the English tea houses I visited at public gardens and garden centers in England during recent trips. Nothing too complicated, just a simple way to enjoy a pause in your day, surrounded by thriving plants. 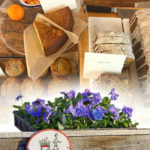 Possible treats include hot cross buns, buckwheat cakes, parsnip cake, green juice and orange-ish juice. Check instagram.com/juliannemurat or email vadeboncoeurconfiserie@gmail.com for coffee house hours (Red Wagon Plants is open every day from 8 a.m. to 6 p.m.). Julianne is taking special orders too, so please let her know if you would like to place a bulk order to take home. You can email her at the above email address, or send her a message through Instagram. In gardening news, it is time to finally get out there! Onions, leeks, cabbage, arugula, mâche, kale, scallions and more can go in the ground now. And you can sow seeds, too. Radishes, carrots, beets, spinach, arugula and peas are willing to germinate in the cool soils of April. Our plants are starting to go to local stores, so keep an eye out for the displays at Healthy Living and both City Market locations. The CVSD School Board has approved RAC’s proposal to fly the Black Lives Matter flag at CVU for 30 days this year. This effort has been almost two years in the making, with extensive efforts made by the Racial Alliance Committee to educate and advocate for racial equity at CVU. By raising the flag, we hope to make CVU a more inclusive and equitable environment, committed to making all members feel welcome and appreciated. CVU’s core principles are to respect ourselves, respect each other, and respect the place. Flying the flag is a catalyst for desperately needed dialogue, a statement of solidarity, and a commitment to equitable change. We affirm that Black Lives Matter is a peaceful and empowering grassroots movement, advocating for justice and collective liberation. By supporting and standing by Black Lives Matter as a school community, we are taking a proactive stance against bias, ignorance, and hate. CVU’s core principles are to respect ourselves, respect each other, and respect the place. That narrative would be incomplete without showing due respect and recognition to students of color, who often face unique and unrecognized challenges at CVU. During the week of April 1st, we will raise the Black Lives Matter flag during a 30 minute ceremony featuring the voices of student leaders. This ceremony is a celebration of our diversity and efforts to make CVU a better place, but is also recognition to the work we still must do moving forward. We encourage any students who have questions, concerns, or ideas to contact us, or consider attending RAC on Wednesday mornings, at 7:45am in the Library classroom. RAC will also be tabling in the cafeteria during lunches this coming week (Monday, Tuesday, Thursday), if any students would like to discuss the flag, or other actions RAC is taking in our community. The instructions were short and simple. Call 911, put the phone on speaker, locate the center of the chest, and press hard and fast to the beat of “Stayin’ Alive” or any 100-measure song. Caitlin and Charlene VanSleet give it a try. On Saturday Feb. 2, over 100 members of the community, including some from neighboring towns, ages 6 to over 70, learned hands-only CPR. After a two-minute video, everyone practiced on a mannequin. 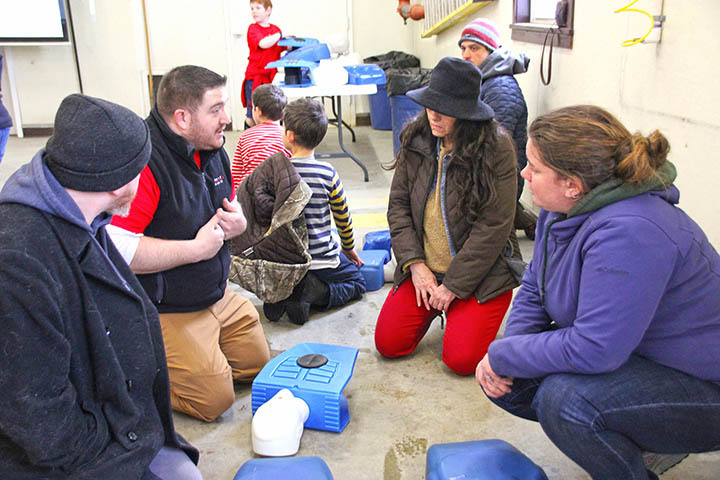 Within 30 minutes, attendees had a working knowledge of hands-only CPR. Thank you everyone who came to learn and to the emergency responders for assisting with the training. 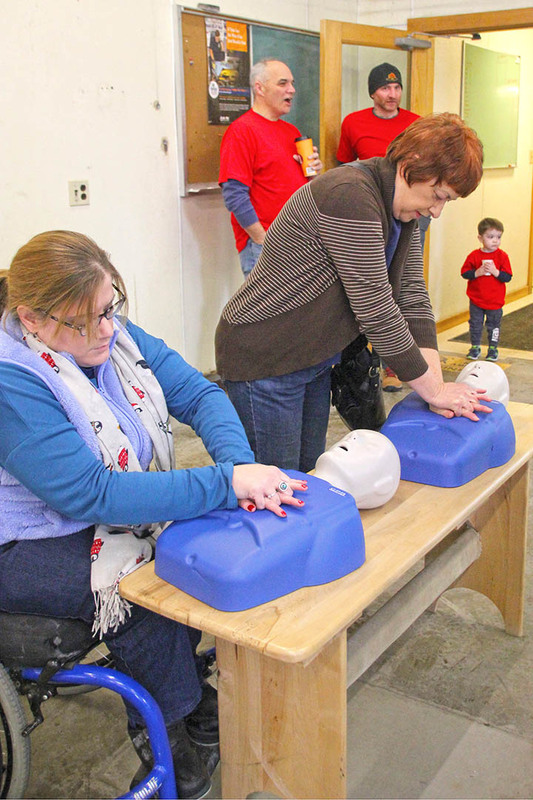 Hinesburg Fire Department is in the early planning of a community cardio-pulmonary resuscitation class for April 6. This is an opportunity to learn all the steps and become certified in the performance of CPR. Lucas Charbonneau explaining chest compressions. If you are interested in attending the class, please email your name and phone number to info@hinesburgfd.org. We will place your name on a list and contact you by mid-March with additional class information. I recently learned of language included in Section 4012 of H.R.2825, which provides for the reauthorization of the federal Department of Homeland Security (DHS), which would allow armed Secret Service agents to enter polling locations – at the direction of the president.